I loved this venue, pretty darned civilized after waiting in long lines to sit on the floor at Winterland or those broken down couches at the Fillmore. Berkeley HS hosted some great shows in this auditorium! This was one of my favorite, when the boys showed up for the encore I rushed forward with most everyone else but left my date behind, priorities. My favorite Joni show of all time was last summer, I was driving west across Nevada heading deep into the past for a long over due visit. My dog and I were listening to a fresh playlist of our favorite Joni tracks -- volume up. It reminded my why every guy capable of growing a scraggly beard fell in love with Her. I was fifteen and had tickets in the orchestra pit, sitting almost directly in front of Jackson Browne and Joni. I remember Joni's describing her life in Greece, the background of her song Carey and others off her new album Blue. That was the only time I saw her in concert and always have warm memories of it. 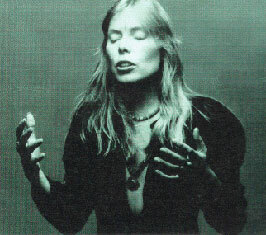 Thank you, Joni Mitchell, for your music and being who you are. I was 23 years old. 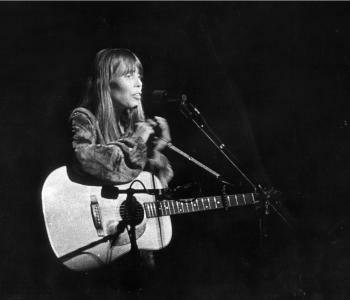 I owned a 1967 D-28 Martin guitar and had tirelessly learned many of Joni's songs in open tunings by this time. My date and I had 7th row seats in the center of the Berkely Community theatre. 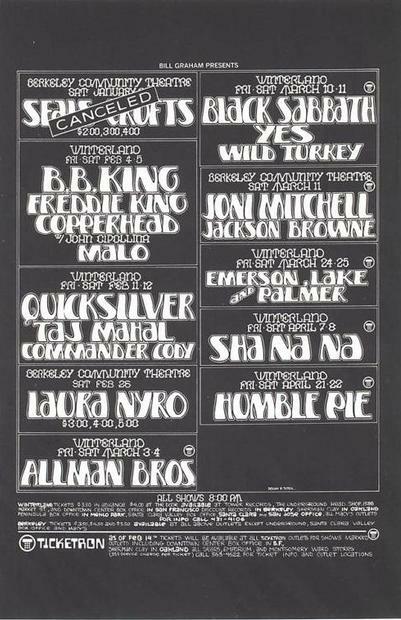 This concert was produced by Billy Graham and he came out on the stage to introduce Jackson Browne who was totally unknown to me but Billy told us he was a new young talent. Jackson was about 25 at the time. Jackson stood at the mike with his acoustic steel string guitar and sang about 6 songs or so including Take It Easy. He was great. Since he was playing alone he provided percussion sounds and back up vocal type stuff by himself in between his regular lines. He'd do the do whapa do's by himself. Really fun. Then Billy Graham introduced Joni. By the way the theatre was totally sold out way in advance. This was THE ticket of the year in the Bay Area. Her Blue album had JUST been released. Joni was wearing a long flowing dress that was cut to the floor, maybe a floral print but definitely a classy hippy style. As I recall she first sat down at the full size grand piano and the love started to pour out. Totally alone playing and singing those most beautiful songs of the age. She then picked up her guitar and stood while she played a few more songs. She then picked up her dulcimer and sat in a chair while played California, A Case of You, Cary. In between songs she was friendly and fun to listen to. She floated between these 3 instruments all concert long playing for a long time. Certainly 2 and 1/2 hours....just Joni and her instruments. I remember her playing River, Cactus Tree, Conversatation, This Flight Tonight, Wood Stock, For Free. She finished what she said was her final song and left the stage. The standing ovation was thunderous. This happened 3 times. Each time she'd wait a little longer off stage before returning. For her 4th encore she invited some friends to come out. Graham Nash, David Crosby, Jackson Browne and about 5 others who I am unsure of. I always thought James Taylor and Jerry Garcia were two but admit I don't know. There was at least one female. So for the fourth and final encore Joni sang The Circle Game. Just her lead voice, her acoustic guitar and 7 or 8 voices behind her singing 4 part harmony on each chorus. There were 3 or 4 additional mikes on stands with 2 to 3 voices on each mike. To call that final song truly remarkable doesn't come close to describing what it was like. Here were some of the greatest and most popular singer song writers of the time paying homage to the greatest singer songwriter of the age. It wasn't at all about them...they were there out of respect and love for Joni. Then the lights came on and everyone left the stage but Joni. Dozens of people had the foresight to bring boquets of flowers which she graciously accepted by bending down over the stage and accepting them from her fans. Joni has always been great to me during every reinvention of herself but I am truly thankful that I got to see her at what I consider to be the peak of her solo career. So pure, so beautiful, so unadorned with unnecessary other musicians. Joni Unplugged! Love you Joni and I sure wish you would play for us again. I was 13 years old and my older sister took me to my first live, non-classical performance. She and I had previously split the cost of a 5.00 album, Blue, and I was transformed, mesmerized for life. And then the performance at the Berkeley Community Theater? I'll never forget it. Some unknown named Jackson Browne opened (loved him), then she took the stage alone in a beautiful outfit and with her instruments. I have never been so enthralled before or since with a musical presence. I clearly remember the encore also: Circle Game. I kept a clipping of the review in the paper until I was an adult. And now? My 22 year old daughter and her peers see Joni as a major influence on their musical world. What a master of her craft. Thank you, Joni. It was utterly spellbinding. I went alone to the concert and felt so amazed, it was very hard to come back down to reality when it was all over. I remember Jackson singing Song for Adam which I had never heard before. 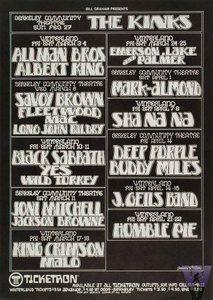 And when Crosby and Nash came out, I could hardly believe it. I'm sure Joni finished with Circle Game, as SteveD remembers. She was perfect throughout, and the concert was unforgettable. either in in Bishop or San Francisco. Concerts would usually let you bring cameras in, as long as they didn't have flash attachments. I was shooting ASA 400 film that I had the developer push to 800 - arcane info for those of you who don't remember pre-digital photography. :) The shot on this page is one of mine. One day I'll get the rest of them scanned. YEARS before someone pointed out what THAT song was about!) He also did Take It Easy - later that year when I heard the Eagles on the radio, I thought it was Jacksonsinging. Blue) and I got a rather fuzzy photo of the bunch of them. It was magical. 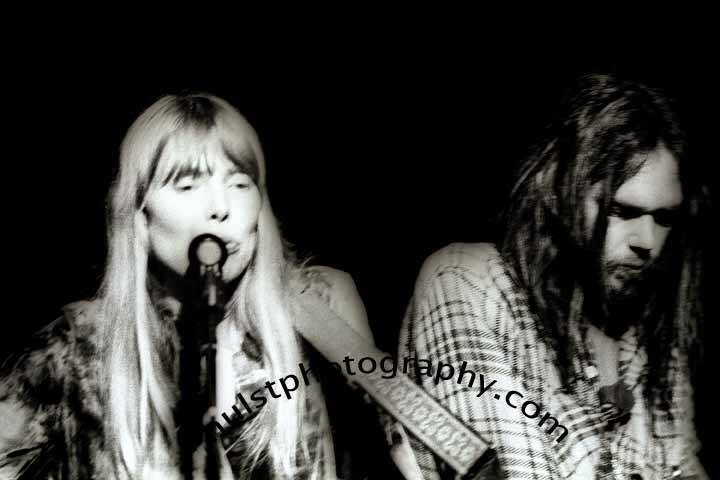 The reviewer for this concert said this was the performance where Joni was officially a STAR. I never experienced anything like it. She finished her sets...did a standard extra couple of songs after the applause. She then left the stage...house lights came on and the sound system was turned off. People kept applauding (I wonder if Joni remembers this)...I times it for TEN MINUTES (you try clapping for 10 minutes and look at your hands! )...finally the house lights went out, sound system came back on...and lovely Joni came back...seemed like even she was in awe. She invited Nash and I guess Jackson...but for some reason I thought Carlos Santana was there too...she played I think two more songs. It was magical...and an honor to have been there are shared the energy. I don't like crowds anymore and I miss you Joni!